Empty patio chairs... I felt lucky to have my camera bag with me the night I left a West Hartford restaurant and walked back to my car, passing these vacated patio tables just after a warm summer shower. Someone had fled the scene, leaving their coffee cup to fill with rainwater. 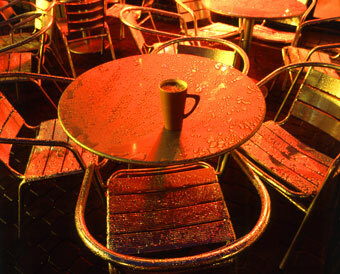 Lights from nearby restaurants and retail stores bounced across the chrome table, animating the raindrops, and burnishing the tables and chairs with swaths of golden and coppery tones. So many times, I’ve told workshop students to watch the light, that photography is all about light. And this night proved it to me once again.